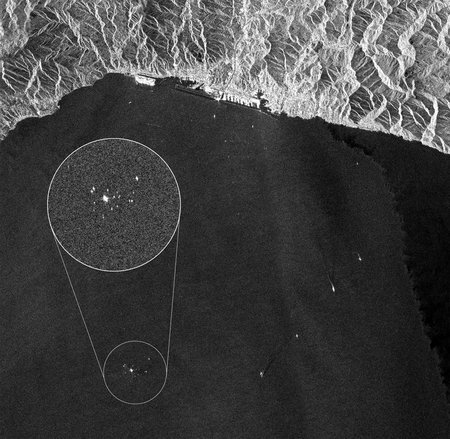 This Sentinel-1A image was acquired on 26 July 2014 over the coast of northwestern Italy while the Costa Concordia cruise ship (enlarged) was being towed towards the city of Genoa. The ship capsized near the island of Giglio in January 2012. Following more than two years of salvage operations, the ship began its final journey under tow on 23 July 2014, arriving at the port of Genoa four days later. During the towing, the European Commission’s Joint Research Centre analysed satellite radar images – such as the one here – over the route for pollution and ship traffic. Sentinel-1A is the first satellite launched for Europe’s Copernicus environment monitoring programme. Surveillance of the marine environment, including oil-spill monitoring and ship detection, is one of the mission’s main tasks. Although Sentinel-1A is still being commissioned to prepare for routine operations, early images like this demonstrate the value of its radar vision. The Copernicus programme also supported recovery operations of the Costa Concordia. Learn more.